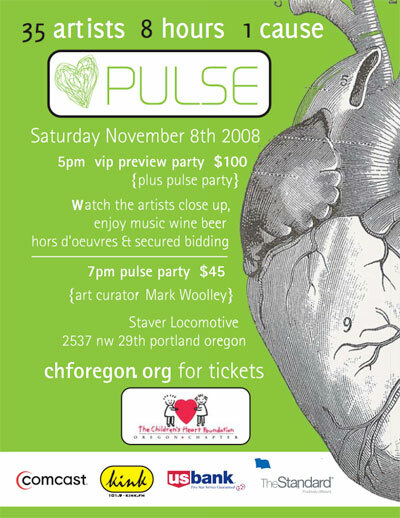 I'm pleased to report that I'll be flying back to Portland in November to make some Etch-a-Sketches for PULSE 2008, the benefit party for the Children's Heart Foundation. I got to participate twice before we left Portland and it's a wonderful event and I still love the idea. A bunch of artists are invited to create artwork from start to finish during the day. Party guests are invited to watch the artists work, and bid on the pieces in a silent auction. Proceeds from tickets and the auction go to the foundation, and many local businesses donate food and drinks, and it's a really fun celebration. You can visit the website for more information and click the image above for a PDF version of the "Save the Date" card. If you want a chance to see me at work AND support a good cause, visit the website and get your tickets now!